In the last of our series of interviews with members of the crew, we take a few minutes over a cup of coffee to catch up with Crew Member Susie. Susie, thanks for taking the time to speak with us. So tell me, how long have you been on the crew? Ouch. Ooh. Erm, thorry. One thecond. What’s the matter? Have we touched on a delicate topic already? Oh, no. Not at all. It’s just that I’ve burned my tongue on the coffee. It’s really hot. Damn. Now I’m going to sound like Jar Jar Binks. [Giggles] I’m sure you won’t. Anyway, as I was saying, how long have you been on the crew? I joined the crew a couple of years ago. I wanted to join sooner, but it didn’t really fit in with my job. But now things are a lot more flexible work-wise, which is great. I’m a garden designer. There are a few of us here who got together to start up our own design practice. And we’ve been working non-stop ever since. I trained originally as a gardener and then did a course in garden design. It’s great to be there at the very start of a project and to then see it right through to being a living garden. What do your colleagues think about you being on the lifeboat crew? They’re really supportive. But they also find it quite funny, because when we get called out on a shout I charge out of the building like an impatient rhino. Our office is only a couple of hundred yards from the lifeboat station, so I’m usually one of the first there when our pagers go off. What about your clients? What do they think? I was just thinking. I do a lot of work with garden landscapers, who are generally quite a gruff and macho bunch. They often take the mickey when they find out that they’re working with a garden designer, but when they learn that I’m on the lifeboat crew they treat me as one of the lads. Do you get that a lot? Do people treat you differently because you’re on the lifeboat crew? Not really differently, as such. But I do find that being on the crew engenders a degree of trust among people. Just as you’d tend to trust a police officer or a teacher. Neighbours ask me to keep an eye on their houses while they’re away. People in the local shops let me pay later if I don’t have enough cash on me. And what do your family think about you being on the crew? My mum and dad always worry a little. I have two brothers in the army, but I’ll always be my parents’ little girl and they’re very protective. I think they’d much prefer it if I stayed at home and prepared planting plans and things like that. But they know that we have the very best boats and protective kit, as well as an extremely high level of training. They live in the town and usually see the lifeboat if it’s heading out, so I always make sure to give them a quick call when I get back. 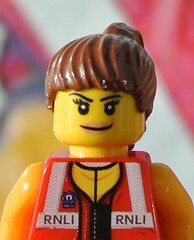 This entry was posted in Interview with the Crew and tagged Crew Member Susie, Lifeboats, RNLI, The Lifeboat Crew by Simon Perks. Bookmark the permalink.